If you drove past this farmhouse in the Northwest corner of Connecticut, you might assume it’s been there for generations. Although it’s new, its design was inspired by historic houses in the area with bold color and Shaker style. Take a look! Their goal was to build a house with “green” technology that was respectful of the historic architecture in the area. It has the layout of a classic New England farmhouse with a center hall surrounded by the public rooms. You wouldn’t even need coffee to fully wake up in a yellow kitchen like this each morning! as well as a geothermal system and drainage cisterns. The screened porch has day beds covered in Sunbrella ticking fabric and doubles as an extra sleeping area in the summer. Do you love yellow? Could you handle this much of it inside — and outside — your house? I painted my first house yellow and quickly realized what a tricky color it is to get just right. We must have gone through five or six different shades until we found one we liked. It was amazing how much the yellow changes throughout the day, depending on where the sun is in the sky and the time of year, too! For more photos and information, check American Farmhouse Style magazine’s Fall of 2014 issue and visit Rafe Churchill’s website to see more of his work. (Photos by John Gruen; styling by Heide Hendricks.) Thanks to Alison for telling me about their project! I love those traditional-meets-modern wing back chairs! They remind me of some West Elm furniture that I covet. It’s really lovely! Hard to believe it is new! This is me all the way! I love the trim. My heart swoons! OMG, I thought I was the only one whose heart ‘swoons’ at the sight of a beautiful house. All the lovely features, both inside and out, are just delightful. The porch! Oh, the porch! This house embodies for me the whole reason I am hooked on houses … simplicity, comfort, engaging design, functionality, color, history, a feeling of peace and refuge … and so on! Love the mix of historic and modern…makes it seem like more of a home rather than a museum. And it makes me happy to see some color! I bet it brightens up the long New England winters. You could almost get a tan in that kitchen, it’s so bright! Love the screened porch with those beautiful daybeds. I like most of the elements in the interior, but I could do without the citrus colors and light floors. The home is very nice, but I was expecting a less modern and more primitive look. That bedroom looks very restful. Only change I’d make to it is to add a rug. Although the colors are not to my taste, it is a lovely home! Lovely ! I can hear the kids playing outside 🙂 It’s big, but humble, while beautiful. And ecological ! It’s perfect. The colour inside are perfect with colour outside. I love everything – even the kitchen! Except the light over the dining room table. That just doesn’t work for me. But the rest I love and the porch I covet. Like against the 10 Commandments covet….. Beautifully realized and classically simple. Admire the environmentally friendly aspects. Not a fan of the color schemes, though, or that dining room light fixture. The Shaker sensibility really comes across as modern, doesn’t it? I’m afraid it’s a little too stark for me. I like stuff! BTW, I have an old bedspread a long gone relative crocheted like the one shown. Love it madly!! Especially the colors and the simplicity…stunning design! I don’t know what it is, but for some reason the exterior made the interior a bit unexpected. Not really a fan of this decor style, although the screened-in porch is amazing and one of the best features! I hate it with a fiery burning passion. 🙂 I’ve been to the Shaker village in Hancock when I was growing up, and this certainly wasn’t the aesthetic *I took away from it. I hate the colors, and there are only two comfortable-looking seats in the whole house. Just SO not my cup of tea. Very nice take on simple without oversimplifying. Agree that the interior beats out the exterior in appeal however. Oh my goodness-I live near this house!!!!!!!!!!!!!!!!!!!!!! Nice house, but the colors…YUCK! Not a fan of the mustard yellow exterior, and I would need a valium to deal with that fluorescent yellow kitchen! And as another reader posted, it’s just too stark for my taste. I’m not an advocate of tons of stuff, but I like a home with some personality. Thank you for sharing this gorgeous house. So authentic looking. I used to live near Hancock Shaker. It’s a special place. Love everything but the yellow kitchen. I would have preferred white with some dark accessories, etc. Other than that, I found the house very relaxing and peaceful. Hate the colors and the exterior is boxy and ugly. Very confused by this house, and had to think about why. 1. “Classic style”…which is desirable in architecture has been completely negated by the painted trims and bold color in the actual architecture. I can’t see the house, I see paint. The overdone “pop of color” trend is over, and this house already looks outdated and needs a laborious paint makeover 2. Maybe you have to be in the house, but just based on the pictures I think every voice and footstep echos. 3. Looks like I saw fabulous soapstone in the kitchen, but I didn’t notice it until the 2nd time I took a look…colors are distracting. Too bad. I wonder what the holes drilled into the bottom of the island are for? Encouraging future tiny residents?? Definitely some good interior and exterior home ideas here. Where are the solar panels though? Sparse is good. I like the outside a lot and the clean look inside. But I don’t care for the modern elements, like the dining room light. 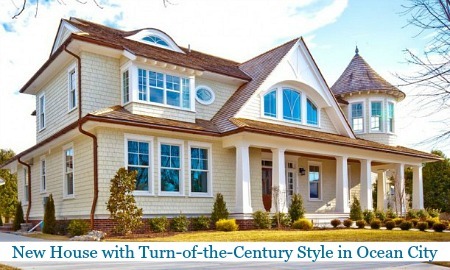 Why do designers always feel the need to “modernize” a historic type house?